While we’re not sure if this book shelf made from books constitutes literary cannibalism, you can rest assured that Yann Martel and Nick Hornby would appreciate seeing their works put to such creative and pleasing reuse. The folks at not tom. came up with this Spring Greening Contest finalist when they saw a box of books being thrown out and “couldn’t bear the thought”. The Book Book Shelf is a definite talking piece and a great way to show off all the titles you (might) have finished. If you’re a fan of not tom.‘s whimsical and eye-catching use of recycling in design then be sure and vote for them in the Spring Greening Competition! Hi there, I've seen a similar design incorporated by a fine artist for an exhibition. I'm not at all saying you copied him/her but am wondering if you know who I'm referring to, as I'd like to follow up on it? Many thanks and excellent work and ideas! I love this design and would like to know if you are making this to sell. If so how much would it cost? Another great approach to this idea would be using the shiny covers of your favorite books and placing them over equally sized recycled wood. That way you can view your favorite books - but no harm would come to them. As a librarian, I am constantly weeding my collection to make room for newer titles. One of the criteria for weeding a book is to see how many times in the past 5 years the book has been off the shelf. I inherited a library in which my first round of weeding involved deleting titles from the collection that had not circulation in over 25 years! If a book has not been opened in 25 years, then that book obviously has no value to anyone. Wish I had known about this option before I had to throw all of those old books in the dumpster! Ultra modern and chic. Perfect for a New York apartment but I wouldn't want it in my home. Hm, I like the idea in general (although I\'d rather try to find new readers for books I don\'t want anymore, after all, that\'s what Bookcrossing and Bookmooch and similar sites were invented for). But I can\'t see myself making such a shelf, because I wouldn\'t want to display old or ugly books or books I wouldn\'t want to read myself in my home, but on the other hand, if I used newer or favorite books of mine for this, it would break my heart to destroy them. So, I\'d only find this idea in any way practicable it would be if there\'s a way to achieve that look without harming the actual books. Jeremy, you make a fair point. I also agree that books should be forever passed on and reread (and felt a twinge of pain at the thought of glue and/or drills), however the inspiration for this project came when the designer saw a box of unwanted pages on the curb being thrown out and wanted to re-purpose it. There are endless arguments against waste but the reality is that it happens, and I think that this is a well executed shift from that direction. 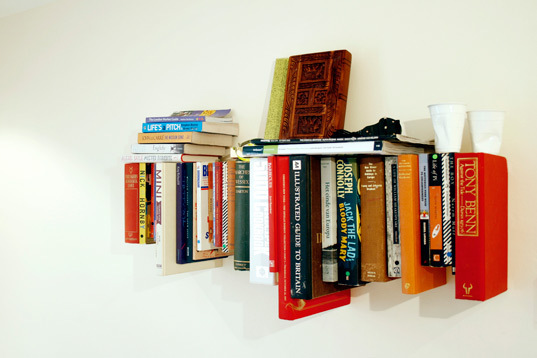 While we're not sure if this book shelf made from books constitutes literary cannibalism, you can rest assured that Yann Martel and Nick Hornby would appreciate seeing their works put to such creative and pleasing reuse. The folks at not tom. came up with this Spring Greening Contest finalist when they saw a box of books being thrown out and "couldn't bear the thought". The Book Book Shelf is a definite talking piece and a great way to show off all the titles you (might) have finished. If you're a fan of not tom. 's whimsical and eye-catching use of recycling in design then be sure and vote for them in the Spring Greening Competition!